During Gill’s initial meeting with Nisha, several of the journal papers that they reviewed contained conceptual figures that had been signed by one of the paper’s co-authors, Dr Robert G. Thorne, of the University of Wisconsin. Gill contacted Dr Thorne, to ask about these figures, and he very kindly provided details of how he produces the figures, together with some more examples of his work. Dr Thorne’s lab produce all of their graphics themselves, using Adobe Illustrator. Dr Thorne himself has been using the software since the 1990’s, and trains his PhD students to use it, along with Adobe Photoshop (for image processing) and Adobe InDesign (for poster layouts). He started adding his initials to his figures to prevent others from using copies of the images without attributing them to him, and he advises his students to do the same when they produce their own figures. Adding his initials also helped to persuade other scientists that Dr Thorne did, in fact, produce the figures himself. This would certainly have been a rare occurrence in the 1990s, although that situation has been changing as graphic design software becomes more readily available. Dr Thorne provided Gill with a copy of an appendix to a book* that contained a dozen examples of his figures, and four of them are included below. A fifth figure was re-drawn by Gill (in Adobe Illustrator) to serve as the header image to this post. These figures demonstrate the issue that Dr Thorne cites as the most important principle his lab adopt when producing figures, and that is to draw images that are anatomically accurate. This obviously requires a deep knowledge of the subject, as well as appropriate skills with Illustrator software. Creating his own figures also allows Dr Thorne greater flexibility in visually communicating his ideas, as he can produce bespoke images for each purpose (figure 11a, below right, being one example he highlights). The figures also demonstrate the advantage of building up a library of visual elements that can then be edited and adapted to suit a variety of situations. 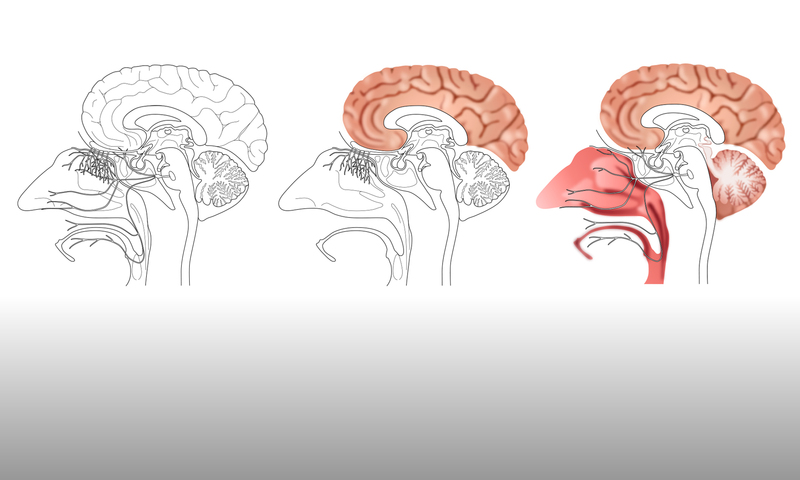 The image of a human brain, seen from a range of viewpoints, provides the basis for many of the figures, with different elements then highlighted or added, as appropriate. Although it takes time and patience in the first instance to draw these basic elements, once you have them it can be relatively quick to then use them to make up subsequent figures. Dr Thorne’s approach to producing his conceptual figures could be a model to try during the collaboration. * M. Hammarlund-Udenaes et al., eds. (2014) Drug Delivery to the Brain. AAPS Advances in the Pharmaceutical Sciences Series 10. Springer-Verlag New York Inc.